Previously, when posting selected headlines, we published one selected headline per post. Iran News Now will be trying out a new format for our selected headlines over the next few days. Based on your feedback we may continue with this format moving forward. Basically, we will publish a daily list of selected headlines, along with commentary where we have something to add. This entry marks our first daily list of selected headlines. It looks as though an effort is being made to distance Khamenei from what Parliament Speaker Ali Larijani calls “extremists”, elements in the regime that have used violence against protesters since the disputed June 12 elections. Majlis Speaker Ali Larijani said on Wednesday that Supreme Leader of the Islamic Revolution Ayatollah Seyyed Ali Khamenei does not like to see certain persons violate the people’s rights under the pretext of following his orders. In a meeting with provincial officials in Central Province, Larijani said extremism will harm the country and create animosity. He stated that the Islamic Revolution has certain principles, and everyone should follow the path of the late Imam Khomeini, leadership, and the Constitution, but they should not follow certain people’s thoughts. Alef Newspaper seems to echo Larijani, strongly criticising those who act inappropriately with the excuse of defending the Supreme Leader. It links an “extremism” which tried to assassinate reformist politician Saeed Hajjarian and attacked dormitories on the Tehran University with the crimes of Kahrizak Prison. As the 40th Day memorial of Grand Ayatollah Montazeri approaches, Alef reminds readers that, even though the Supreme Leader issued a statement upon the demise of Montazeri, some extremists attacked Ayatollah house and broke the windows. Those extremists also treat other Revolution figures (e.g. Rafsanjani) the same way. Alireza Beheshti is the son of Ayatollah Mohammad Beheshti, one of the main architects of the constitution of the Islamic Republic. The fact that Alireza Beheshti is in prison is very telling about the current regime in control of Iran, considering the importance of his father to the Islamic revolution. He has apparently had a heart-attack while in custody, but has informed his family that he is now “better”. 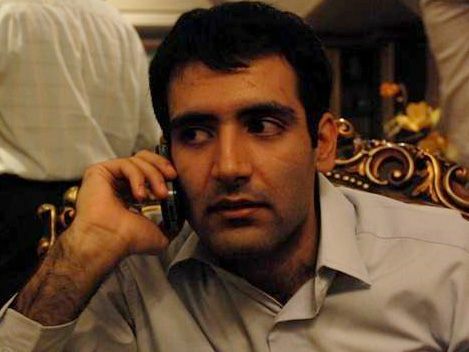 Amir Kabir Newsletter reports that post-election detainee, Majid Tavakoli, has been sentenced to eight and a half years in prison, as well as five years ban from political activity and ban from exiting the country. He was brought to the Intelligence Ministry handcuffed and blindfolded. The reason for his arrest — “insulting the leader”, meaning Khamenei. Four people have been arrested after an Iranian state prosecutor was shot dead outside his home in northern Iran. Iran vowed Monday to take revenge on Israel and the United States for the killing of a physics professor in a bomb attack last week, the official IRNA news agency reported. Iranian officials have blamed an exiled opposition group known as the People’s Mujahedeen, accusing it of acting on behalf of Israel and the United States, for the killing of the physicist, Masoud Ali Mohammadi, above. The opposition group and Washington have denied involvement. “If Alimohammadi was murdered by hardliners, then the message would be clear: that they are willing even to assassinate well-known and well-respected academics,” says materials scientist Muhammad Sahimi of the University of Southern California in Los Angeles, “and that other academics must think twice before they participate in political activities to support Mousavi”. According to Rahesabz, during a speech given to about 2000 army soldiers in which the late Grand Ayatollah Montazeri was criticized, the soldiers started “coughing” in protest, forcing the speech to be canceled. To keep up the momentum of the text-organizing, the latest Green Movement has called for a Sokoot-e-Sabz, a day of Green Silence, from 7 am to 8 pm. Though I initially asked myself, “what use is it to be quiet for 12 hours? Would that be the opposite of civil disobedience?” But the opposition is using this lull in the protests to keep in touch with their base. It’s also an attack on media and cell phone companies who have been colluding with the government to monitor communications among the opposition. The latest figures on the value of various currencies against the US dollar show that Iranian rial is only stronger than dobra of Sao Tome and Vietnamese dong. Iran plans to knock three zeros from its national currency, the rial, so it can recover value it has lost in recent years, President Mahmoud Ahmadinejad was quoted as saying on Wednesday. “We are due to remove zeros from the currency… because for some reasons the rial has depreciated and we should bring its real value back,” the Mehr news agency quoted Ahmadinejad as saying. The rial has dropped on international exchanges from 70 to the dollar at the time of the Islamic revolution in 1979 to around 10,000 rials today. Although the controversial Ahmadinejad’s chief of staff, Esfandiar Rahim Mashaei has rejected reports on his resignation as spread rumors, some influential figures in the principlist fraction of Iranian Parliament (Majlis) observe the issue differently. At the impromptu meeting the representative of the Islamic Republic’s Tourism Ministry invited Israeli Tourism Minister Stas Misezhnikov to visit the cities of Shiraz and Isfahan. “We have wonderful nature reserves and cultural sites, you are welcome to come and visit,” the official who is in charge of Iran’s stall at the fair was quoted by Israeli media as telling the minister. Considering the reaction from hardliners several months ago, when Mashei said Iran is “friends of all people in the world – even Israelis,” the regime’s reaction to this is, sadly, predictable. Baidu filed suit in New York against Register.com, claiming that the domain registrar’s “gross negligence” led to the search giant being “unlawfully and maliciously altered,” the company said in a statement Tuesday. Baidu’s site was disabled for several hours on January 12, and visitors were redirected to a site where a group calling itself the “Iranian Cyber Army” claimed responsibility for the attack. The same group had taken credit for a similar attack on Twitter last month. The U.N. nuclear watchdog said on Wednesday it still hoped to seal a draft deal on enriched uranium between Iran and big powers despite Tehran’s rejection of terms meant to stop the material being used for atomic bombs. Diplomats familiar with the International Atomic Energy Agency’s contacts with Iran said on Tuesday that Tehran had notified the U.N. agency about two weeks ago that it could not accept central aspects of the draft deal. This followed months of dismissive or ambiguous remarks made through the media.